At Coachmen, we want you to get the most out of your Coachmen RV, so we have provided useful programs and tools for our owners to help enhance the ownership experience. From one FREE year of Roadside Assistance, to Digital Owners Manuals and FREE membership in Coachmen Owner’s Association, Coachmen RV is dedicated to making time with friends and family enjoyable. We’re your Leader to the Great Outdoors. At Coachmen we realize that you are always on the move. That is why we have created an owner’s manual designed to keep up with your camping experience. 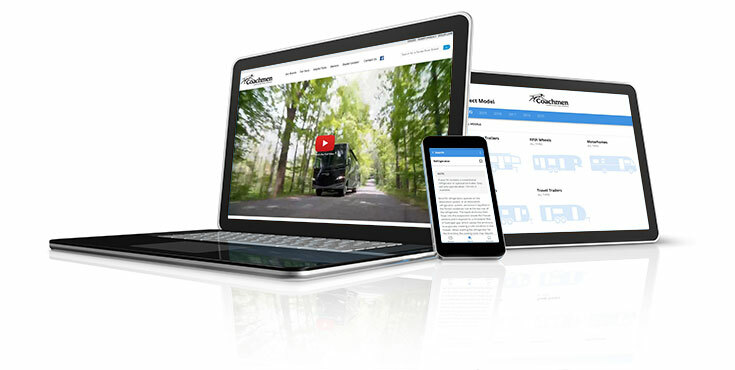 Our interactive electronic manual allows you to always have the information you need about your RV right at your fingertips without the worry of misplacing or damaging it. View it on our website, or download the app and take it with you wherever you go! Thank you for purchasing a recreational vehicle from Coachmen RV. We are dedicated to building a quality, dependable product, and we back them up with a limited warranty. These warranties are found within the Electronic, Interactive Owner’s Manuals. We have also provided direct links below for your convenience. If at any time the need arises to speak with a warranty representative about issues with your Coachmen RV, please find phone numbers and e-mail information on our Contact Us page. Thank you for purchasing a Coachmen RV and placing your confidence in our Company. We understand your expectations of a trouble free and rewarding ownership experience and we are committed to standing behind our product, providing you with the service you expect and deserve. At Coachmen, customer satisfaction is our #1 priority. Accordingly, we want to assure that your questions are answered and any issues you may have are resolved. Please be sure to first direct your product questions or concerns to the appropriate Coachmen Team Members in our Contact Us portal. If after contacting the recommended Coachmen Team Member in our Contact Us portal you are still not satisfied… please tell us. Simply call 1-574-825-7000 or email ownerrelations@forestriverinc.com. When you purchase a new Coachmen RV, you and your family will travel safely with a one-year complimentary roadside assistance membership.